Suitable for bolt tightening in hydraulic manifold. 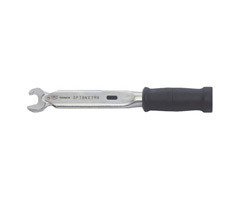 Open spanner specially designed for a narrow space use such as hydraulic piping. No need to order special-made SP, and no need to worry about the strength limitation. It requires the dedicated tool to change torque to prevent accidental torque change.